The Camping meadow is approached over an old bridge crossing the now redundant railway track that bisects the campsite. The meadow is surrounded by ancient woodland and a Site of Nature Conservation Interest. The pitches are large and well spaced and we allow camp fires. Firewood and charcoal are available for sale from reception. 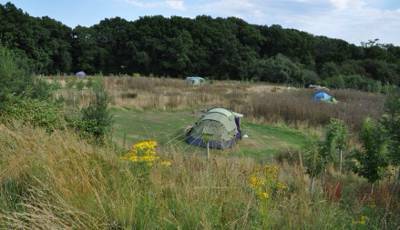 The Meadow is car and dog free and we have great shower, toilet and washing up facilities. The Meadow is alive with wildlife, from nightingales in spring, glow worms during the summer and owls and deer in the adjoining woods during the autumn. If you would like two adjoining pitches please contact us.